Are you looking for some new and different ways to decorate for July 4th this year? It is one of those holidays that we can decorate a lot or a little just to show our patriotic pride in our country. It is also a time that the decorating does not have to be up for very long if we do not want to. A lot of families pick this holiday to have a picnic in the park or perhaps in their own backyards. We might have a home that is along the local parade route and we want to decorate our porches and yards for those who are in the parade and the ones lined up to watch to enjoy. It might be that you want a few pieces inside the house to be festive but do not take up too much room. As I decided to write this post, I thought I might look for something a little more than the typical flags, banners and buntings that are pretty prevalent in many of our local stores. My guess is that you might be looking for something just a tad different than what everyone else has. Am I right? A Uncle Sam 4Th Of July Mailbox Cover could be something fun to use as a decoration for a couple of days around this American holiday. He attaches to the mailbox using velcro and does take a little bit of work before you let him sit atop the box. He has not stuffing so you will need to fill him up with something. The manufacturer suggests using old grocery bags which is actually an awesome idea. Using those plastic bags instead of sending them to the landfill. Patriotic Flamingo Yard Decor There was a time that I thought the flamingos in a yard were well, tacky, but that was when all there was to choose from were the pink ones. Now, I love these birds when they have a theme for a holiday. 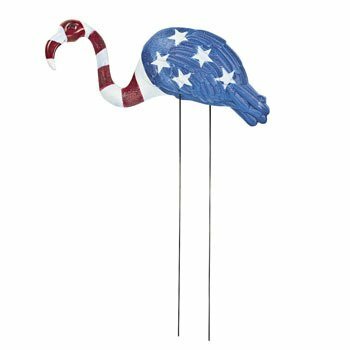 All decked out in red, white and blue this would look so fun in the yard! Standing in a flower bed, next to a tree or anywhere you might like to place him. You could get him a friend or two to keep him company and add to the visual. Although, just one makes a fun statement. My very favorite item that is available this year is the July 4th Backyard Party Buffet Cooler. I just love it! I would show you a picture of the the item but the seller has made it very difficult to show their product. Kind of silly, if you ask me, but I love it so much that I wanted to let you know about it anyway. What a great and functional way to decorate a table and keep those salads and soft drinks cold for the picnic. Of courser there are more but these three just caught my attention so I wanted to share them with you. Do you have a favorite way to decorate for the 4th of July? Let me know in the comment section.